Phone manufacturers seem to enjoy putting out new colors of existing phones. Samsung's been doing it for a while, OnePlus did it with the Sandstone White and Lava Red OnePlus 5Ts, and now LG is starting to want a piece of the pie. Having announced a Raspberry Rose color for the V30 earlier this month, LG is now bringing Moroccan Blue and Lavender Violet to the G6 and Q6, as well as Raspberry Rose for the G6. It's not as if these phones had any shortage in color choices. The G6 and Q6 already came in the same five colors: Astro Black, Ice Platinum, Mystic White, Terra Gold, and Marine Blue. That being said, only the first three of those are offered stateside for the G6 (and only Platinum for the Q6), but hey, we've gotten used to getting snubbed in terms of color options. The sophisticated hue of Moroccan Blue was inspired by the beautiful blue buildings in the city of Chefchaouen, Morocco. The silvery, romantic shade of Lavender Violet was developed to appeal to both men and women who appreciate the finer things in life. Raspberry Rose offers a strong color saturation that is unique among current smartphones and was designed with anniversaries, graduation ceremonies and Valentine’s Day in mind. These colors are slated to roll out in South Korea starting in February, with "key markets worldwide" to follow. LG isn't saying if any of them are making their way to the great US of A, but given how the Raspberry Rose V30 is only going to Europe and Asia, we're not holding our breaths. SEOUL, Jan. 30, 2018 — LG Electronics (LG) will make the LG V30’s popular color options of Moroccan Blue, Lavender Violet and Raspberry Rose available on the LG G6 smartphone and Moroccan Blue, Lavender Violet for the LG Q6, giving consumers more beautiful options than ever before. With the world’s first 18:9 aspect ratio screen on a smartphone, the LG G6 and its 5.7-inch FullVision display was specially designed to be comfortably held in one hand. With three new colors joining Astro Black, Ice Platinum, Mystic White, Terra Gold and Marine Blue, the LG G6 will look great in anyone’s hand. The LG Q6, popular for its large display and premium features at an affordable price point, comes in seven color options with Moroccan Blue and Lavender Violet joining Astro Black, Ice Platinum, Mystic White, Terra Gold and Marine Blue. 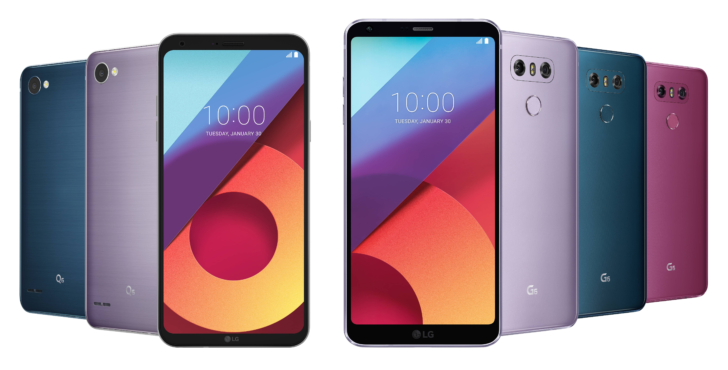 With the introduction of the new LG G6 and LG Q6 colors, consumers have more options than ever before in finding a smartphone that best expresses their individuality. The sophisticated hue of Moroccan Blue was inspired by the beautiful blue buildings in the city of Chefchaouen, Morocco. The silvery, romantic shade of Lavender Violet was developed to appeal to both men and women who appreciate the finer things in life. Raspberry Rose offers a strong color saturation that is unique among current smartphones and was designed with anniversaries, graduation ceremonies and Valentine’s Day in mind. The new colors will first roll out in Korea for the LG G6 and LG Q6 in February 2018 followed by key markets worldwide. Additional details, including pricing and release dates, will be announced locally.